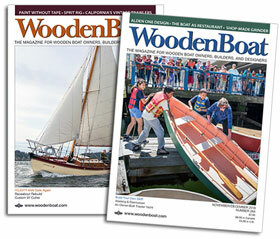 For our 40th anniversary issue of WoodenBoat, we asked the magazine’s founder, Jon Wilson, to specify his current dream boat. He responded with specifications for an amphibious houseboat—one “with a measure of grace and more than a modicum of seaworthiness.” It was a challenging assignment, for the boat had to be liveable both on land and in the water—with ample storage, comfortable seating, and good seakeeping qualities. The designers responded with Gypsy, a 27-footer with a tunnel stern, a box keel, and an above-water appearance that blends the traits of an English narrowboat with a Gypsy vardo. Above are two rotating three-dimensional models of the boat. 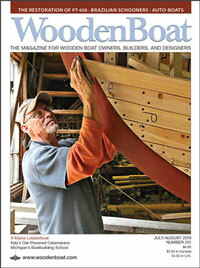 To read and view the full description of the design, pick up a copy of the September/October issue of WoodenBoat (No. 240).